The S&P 500 hit new all-time highs last week and finished the week 1.47% higher. Earnings season has finished and the results were much better than expected. The stronger earnings have helped keep equities elevated despite the heightened political risk of the last few weeks. The trailing P/E has come down slightly from its previous high of 22 to 21.4. The rally last week was very interesting in that it was led by both utilities and technology, which have recently shown an inverse relationship. Utilities were up 2.53% while technology was up 2.22%. Energy was the largest detractor as oil prices declined following the OPEC meeting, with the sector finishing the week down 2.25%. The 10-year interest rate was up two basis points last week as economic data was mixed. 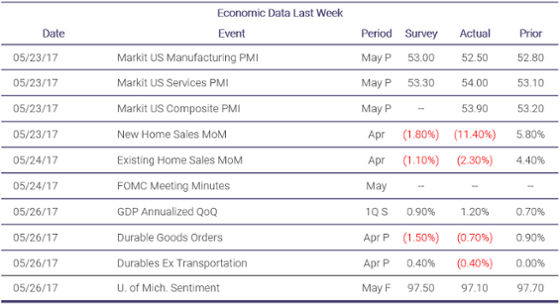 Existing and new home sales numbers missed expectations early in the week, but data finished strong with a higher than expected revision to Q1 GDP to 1.2% and a stronger headline durable goods number than expected. The euro cooled off last week despite strong economic data out of the Eurozone, with PMIs coming in much higher than expected. Germany’s PMI reached a new relative high of 59.4, propelling the Eurozone composite PMI to 57. Oil rallied early in the week as markets began to believe that OPEC would not only extend the prior production cut agreement, but would also deepen the cuts. Oil increased to near $52 per barrel by Thursday morning on these hopes, but after the official OPEC announcement declared that the cuts would be extended but not deepened, oil sold off and finished Thursday down nearly 5%. The weekly move was a bit more muted due to the gains early in the week, and oil finished down 1.05% at $49.80. The US inventory report once again showed a larger drawdown than expected in of all of the major products. Also matching their recent trend, rig counts and US production increased again last week. 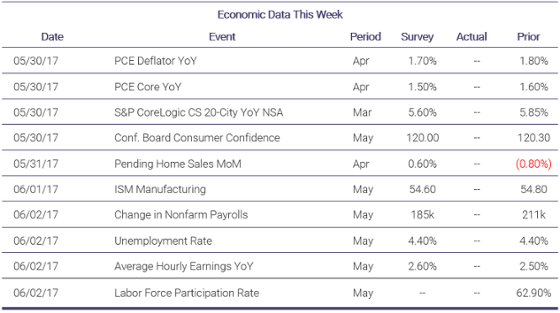 The jobs report on Friday highlights another busy week of economic data that includes PCE, housing data, and the ISM Manufacturing survey.